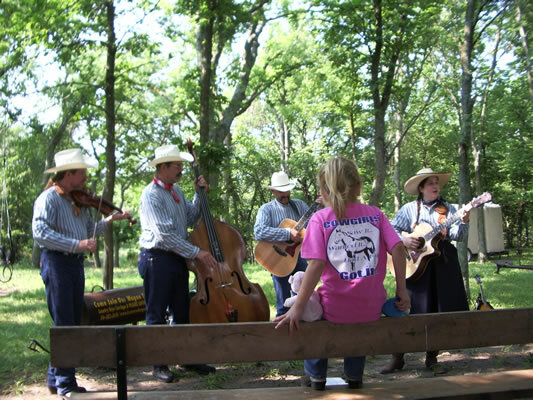 Have you ever wondered what it would be like to travel west with a wagon train like the pioneers? We did, so we joined a wagon train on the Santa Fe Trail in Kansas. We were on the trail a very short time when our new friend, Shelby, yelled, “Look! Indians!” There were two Indians on horseback silhouetted on the horizon; they had their rifles raised. At first we were afraid but they were friends who came to guide us – Naduah, a Comanche woman, and Steve, a Buffalo hunter. 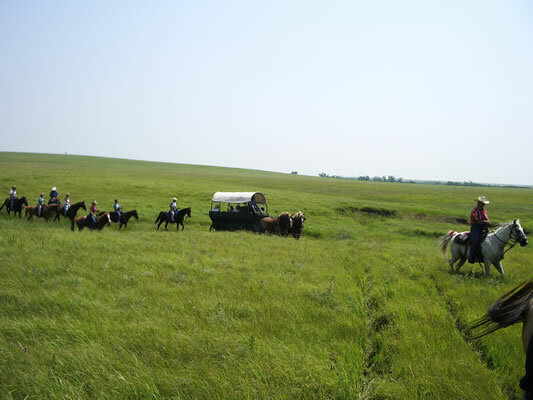 Even though the prairie looks flat it is really bumpy especially when the wagon we were riding in went rumbling across the creeks. After a while we got use to it. Most of the settlers walked. We found walking was not easy because the wagon train moved faster than we could walk. When we stopped to let the horses breathe, it was time to learn about the prairie. The prairie is beautiful. The green grasses are dotted with flowers and the sky looks so big. We could see 15 miles. It is second most diverse ecosystem in the world. Only the rainforest is more diverse. Naduah said, “By the end of the summer the prairie grasses will be over five feet high.” We would like to see that! The buffalo in this part of Kansas were gone when the settlers went west but we could still see buffalo wallows – indentations where the buffalo rolled around in the mud to get rid of bugs. Our teamster, Marvin, taught us about driving the team of horses. He explained, “The harness is designed so the horses are really pushing, not pulling.” We had a hard time understanding that! That’s where the term “put your shoulder into it” comes from. The outriders rode ahead to scout the trail; when they found the best place to cross a wet or rough area they would position their horses on either side of the trail. Then the teamsters would drive the wagons between the outriders’ horses. In the evening while the men tended to the horses and the women made dinner, we helped grind corn and coffee. When our work was done, Naduah told us her life story. 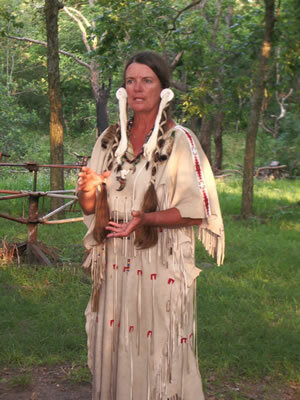 She was kidnapped when she was a young girl and was raised as a Comanche. Her story was spellbinding! After dinner we relaxed by listening to songs. One song was about the Santa Fe Trail. One line said it was “traveling through heaven but living through …” – well, we can’t say the word but it is the opposite of heaven! The cicadas and crickets were so loud we thought they were trying to compete with the singing. The prairie is beautiful at night. There were thousands of stars and fireflies. We slept in one of the wagons and drifted off listening to nature’s chorus. We woke up early. Guess why? The Coyotes were calling, but we didn’t see any. In the morning while the womenfolk were cooking breakfast we learned how to lasso and make fire with flint. There was a lot of flint because we were traveling through the Flint Hills. By the second day we were use to the ways of the trail. 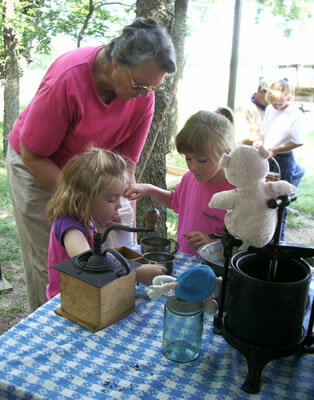 We learned so much and there was so much more to learn we were sorry when we had to leave the wagon train. Going west was hard work but the scenery was beautiful, and in the evening, when all the work was done, it was fun.